Our time tested process begins deep in the New England woods by retrieving 16 foot veneer and select grade logs during the wickedly cold Maine winters. 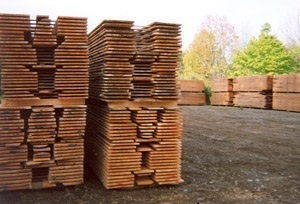 We personally travel as far as Northern Vermont, Connecticut and western Massachusetts to hand select each log we use. Less than 1% of the logs we inspect meet the quality standards we set for ourselves, and only the best handpicked logs become the famous select grade boards we make. 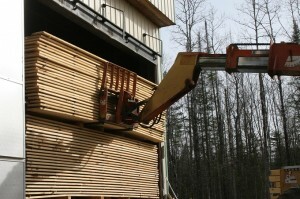 Before spring arrives, the logs are sawn into rough cut boards. Each board is inspected, then stacked and stickered for air drying. Air-drying gently and evenly removes moisture from the boards before they enter our state of the art dehumidification kilns. Properly drying all of our boards during the cold months results in a higher quality plank that is always stain free. After air-drying, the boards are placed in our kilns. Over a two week process, the temperature is slowly raised as moisture content is brought down to 6 to 8%. Kiln-drying is a delicate process that must be done correctly so the boards won’t warp, crack or release sap (called pitch) after they are installed in your home. Our floors are kiln dried so well that you should install them without any acclimation period, and even our widest boards are sufficiently stable to be laid over radiant heat. After kiln-drying, the rough cut boards are individually inspected before being lightly planed and put into dry storage. Over the year, we pull the boards we need for each order. At this point the floor is finally ready to be planed a second time, to a mirror smooth finish. We make sure each board shows its best side, grain pattern, and character. Each customers floor is milled when they place their order so the planks remain at their maximum dryness and perfectly straight. The edges are precisely milled with a tongue & groove, shiplap, or straight edge profile, making them easy to install. Our tongue & groove profile is designed so the top groove is slightly thicker than the bottom, with the tongue being offset slightly lower. This allows you to sand and refinish your floor multiple times over its lifetime. When properly installed and finished, our pine floors will last for many generations to enjoy, and our guarantee backs that up.